Getting off a red-eye is always nice but stepping into Munich Airport was even better. Well designed and surprisingly quiet. There were plenty of people there but there was not the noise level I associate with O’Hare. I loved it. Rental car rented and off to get rid of the luggage I was excited to see Munich for the first time and hopefully discover some great food in the process. Everyone I spoke to about the city raved about it and declared it their favorite city in Germany. So I had high hopes for the two days I would be there. First stop was Marienplatz to walk around and get some coffee. Stopped at an Italian cafe that served up great cappuccino. I was too jet lagged to remember to take a picture; you’ll just have to trust me on it. 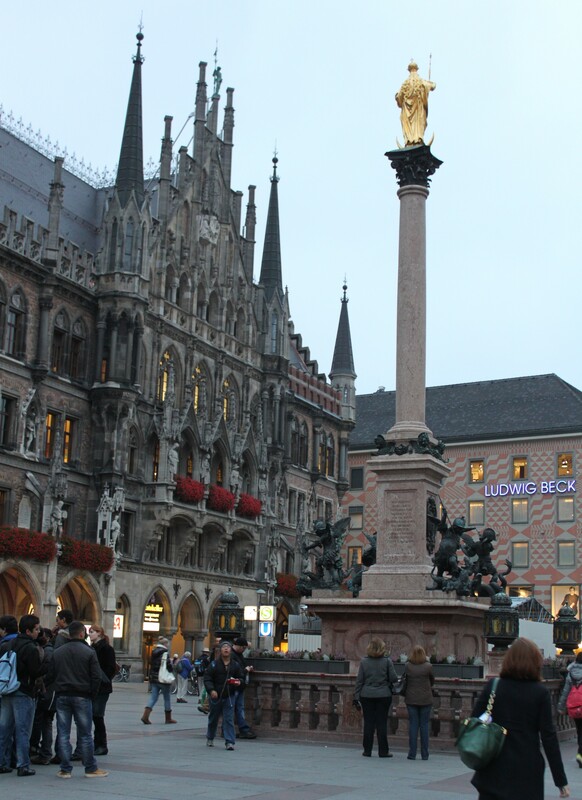 The first thing I noticed about the squares around Munich is that everything looks perfect. Every building is beautiful, in order and no trash. It looked like a movie set to me. 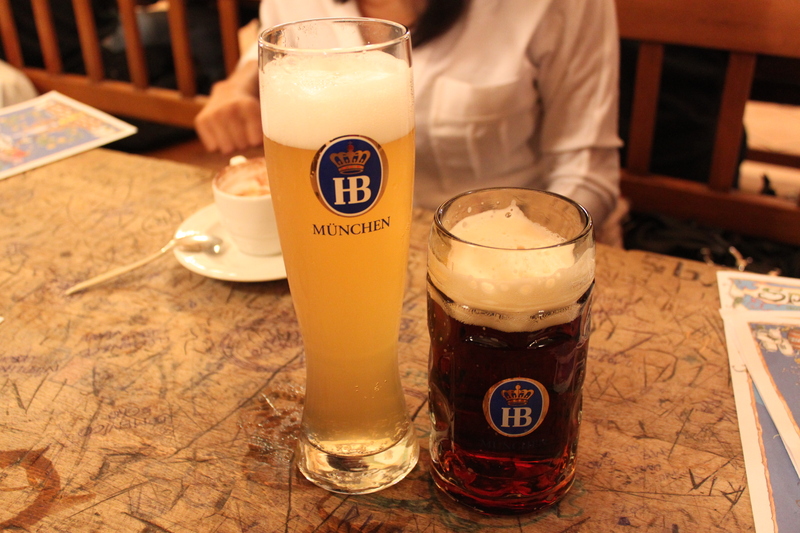 After some sight-seeing and shopping came the first obvious drink/snack stop, Hofbräuhaus München. It was early evening on a Monday so I avoided the packed weekend/college/tourist crowd. Murals cover the ceiling of the different rooms in the restaurant. With the outdoor seating there is easily a 500-person capacity. A band was playing and it got me in the mood to order a beer. The Bretzel (pretzel) I got was nothing special but I guess you don’t come there for the food, do you? 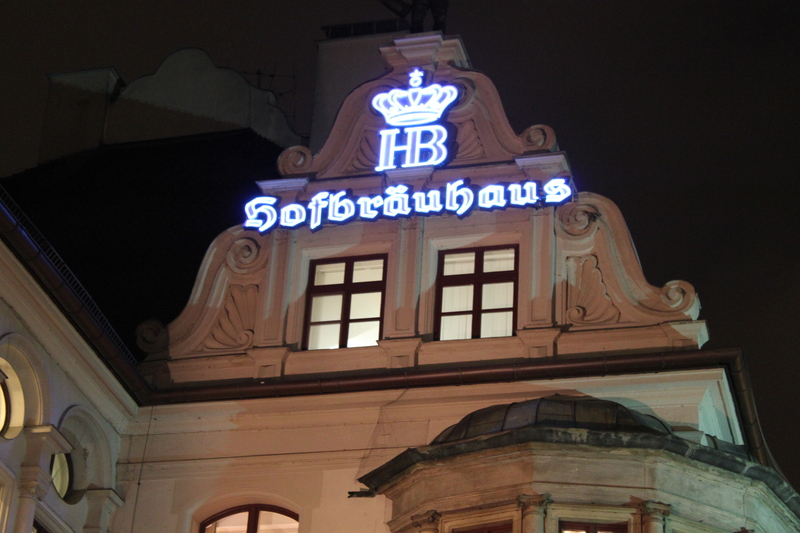 “In München steht ein Hofbräuhaus – oans, zwoa, g’suffa!” (In Munich there’s a Hofbräuhaus – one, two, down the hatch). Prost! 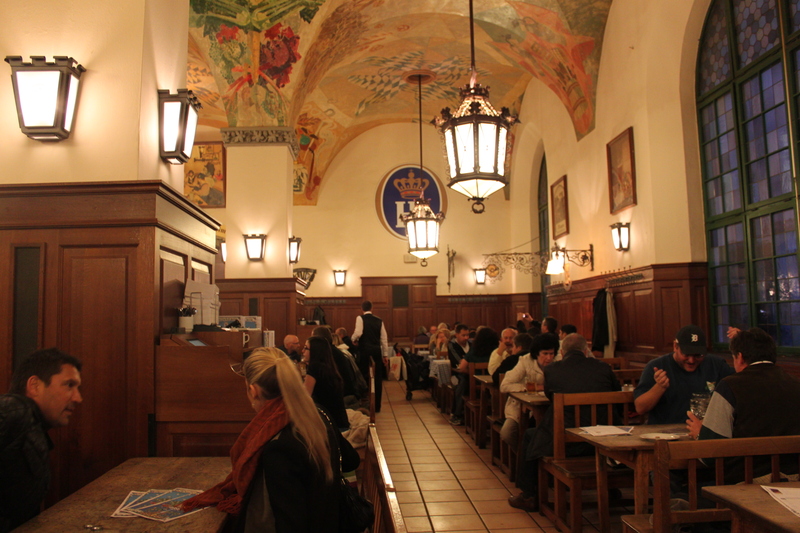 I was getting hungry so off to L’Osteria im Künstlerhaus, which was recommended by a neighbor. 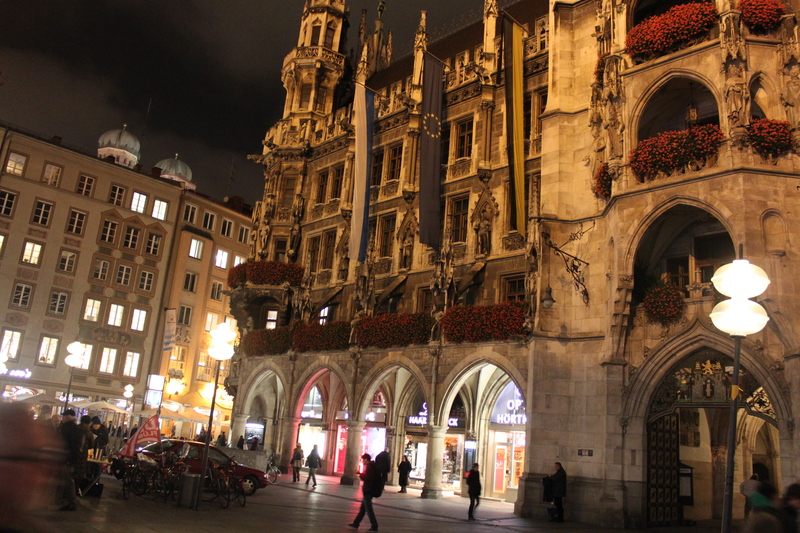 A stroll through Maximiliansplatz on the way proved Munich is just as beautiful at night. 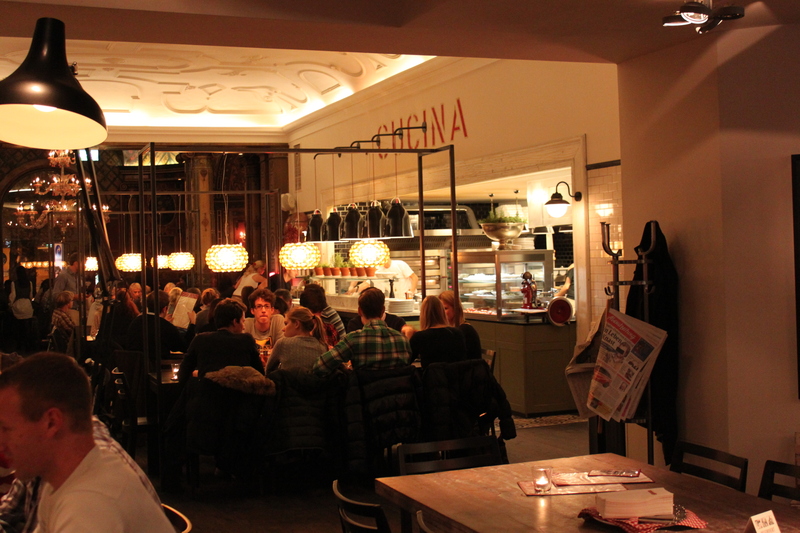 L’Osteria is one of two restaurants in the Künstlerhaus. The front dining room is dramatic and unexpected compared to the entrance of the restaurant which, is more modern and trendy. This restaurant is worth visiting if only for the architecture. I went with a really basic order, Caprese and spaghetti and meatballs. 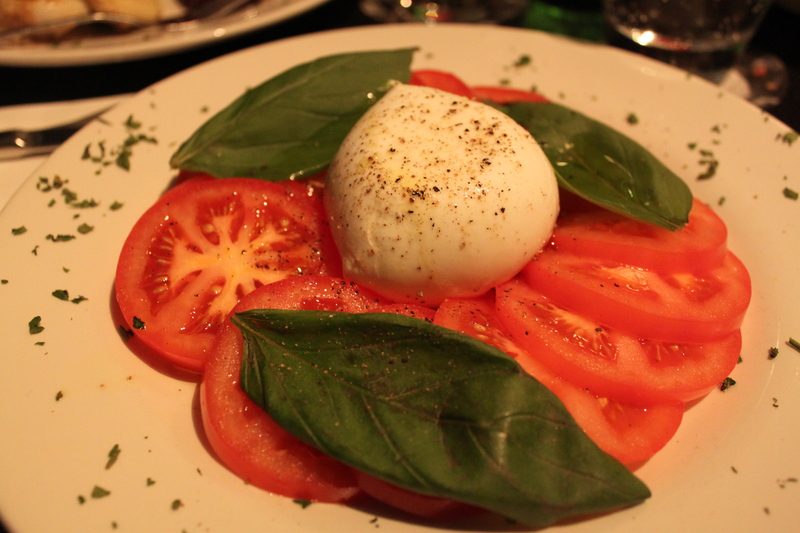 The Caprese had really fresh buffalo mozzarella and the balsamic was sweet and rich. My dinner mates ordered the mussels but I am allergic so I could not partake. 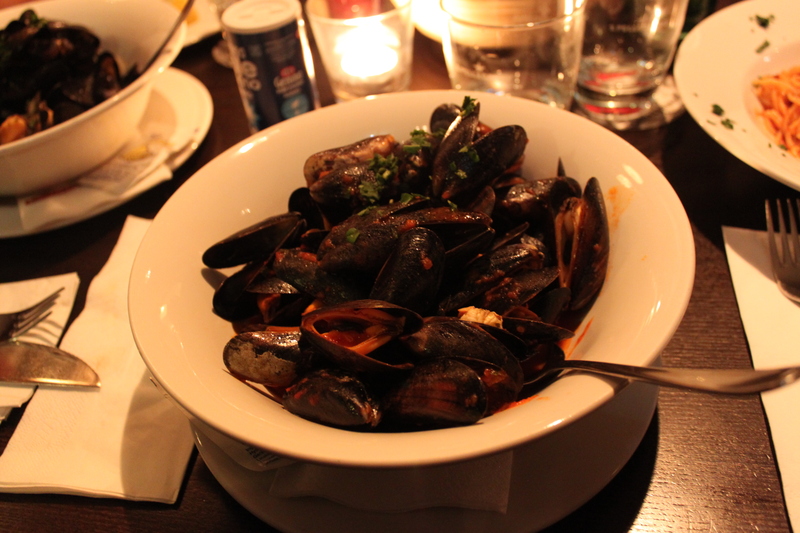 Judging from the 5 minute silence that ensued I believed them when they said they really liked the mussels. It looks like the thing here to order is the pizza. Pretty much every table had one and it looked and smelled delicious. Next time. Day 1 complete I headed back to the hotel for some much-needed sleep. Day 2 coming soon. Guten nacht. Bis später. Vielen Dank – sehr interessant Alicia!